Blue Sky Disney: A Mouse In The Garden? The Los Angeles Times is reporting what Al Lutz over at Miceage did a few days ago about the Walt Disney Company leasing space at the Anaheim GardenWalk for two hotels... one moderate priced family hotel and another luxury hotel catering to the Uber-Rich. Now, I've heard rumblings about Disney negotiating with the GardenWalk folks, but brushed it off until now as sheer speculation... relenting to pressure, I've relayed secret transmission signals to my Bothans to confirm this. More about this a new Anaheim Blue Sky Alert later in mid-September. Oh, and those that keep e-mailing me about a Hong Kong Update... it's coming. Most likely at the end of September. Why do they have to build off the resort? Don't they have enough parking lots that they can add these hotels? As someone who knew about this for a few weeks, and is true (but nothing has been signed, it is still a work in progress). 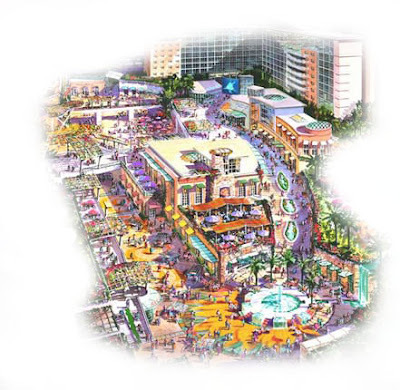 As for why at the Anaheim Garden Walk compared to current Parking lots. Anaheim City code requires a certain amount of parking spaces depending on the use of zoned land. It is a LOT cheaper to let someone else build a hotel with the "Disney" name compared to a a lot on AGW with prebuilt parking is a LOT cheaper. So they are still building the one next to the PP Hotel? Honor seems pretty sure of this. I wonder what theme it will be? Wonder what themes will the ones in GardenWalk going to be?